The construction credit world is chock full of industry-specific terms and definitions; sometimes it’s tough to keep them straight. “Bond” is one of those terms. Is it a payment bond, performance bond, bid bond, contractor’s bond, prevention bond, discharge bond? And, who is a party to a bond? What are Common Bond Types in Construction Credit? Most Common Bond Type We Work With? Payment Bond! A payment bond is a surety bond, particularly on public projects, issued as an assurance of payment to certain parties should the principal of the bond breach their construction contract. Bonus: In Canada, a payment bond is often referred to as a Labour and Material Payment Bond. Pros Know these Best Practices! A performance bond is issued to one party of a contract as a guarantee of the performance of the other party to meet the obligations specified in the contract. Heed! Payment and performance bonds are often issued together, but they guarantee very different things: payment bonds guarantee payment, performance bonds guarantee performance. At NCS, we don’t work too closely with bid bonds, though we do see them. The key to remember here is a bid bond is used during the bid process and is for the protection of the obligee (the party requesting the bids). A bid bond guarantees the contractor will accept the award of a contract under the terms stated within their bid or the surety will compensate the obligee. In some states, a bid bond converts to a payment bond! Ohio provides a form of bond that at first is just a bid bond. the bond then transforms into a payment and performance bond. HOWEVER, the bond only converts to a payment bond once the contract has been awarded. Although prevention bonds & discharge bonds are not the same, I put them together because they share the same goal: attach security to the bond rather than the property. You may be familiar with discharge bonds if you have ever received notification that a lien has been bonded off or bonded around. A bonded off lien does not eliminate your rights, it changes your rights. Instead of pursuing the claim against the property, you would pursue the claim against the bond. In some states, such as California, a contractor is required to obtain a bond before they can get a contractor’s license. Essentially, this bond obligates the contractor to adhere to various rules/regulations and helps protect consumers and other businesses mitigate loss if issues such as fraud arise. Who is a Party to the Bond? Earlier, Mark mentioned it’s important to know who the principal of the bond is. The principal, sometimes referred to as the obligor, is the party on the bond that has an obligation to pay the debt. In construction, we frequently see bonds where the General Contractor is the principal or obligor. The other important party on the bond is the obligee. The obligee is the party the principal is bound unto or contracted with. I mentioned we frequently see bonds where the GC is the obligor, which would make the project owner the obligee. Principal: whose bond is it? Obligee: with whom did the principal contract? Surety: who is the bond company/insurance company? Claimant: who is covered by the bond? Is a Payment Bond Required? Each state has its own statutes requiring payment bonds on construction projects. Some statutes may require the general contractor to obtain a payment bond on every construction project, and other states may only require a payment bond when the total value of the construction project exceeds a certain threshold. Download a copy of our Quick Reference Guide: Thresholds for Payment Bonds on Public Projects to learn more! Are You a Claimant Under the Bond? 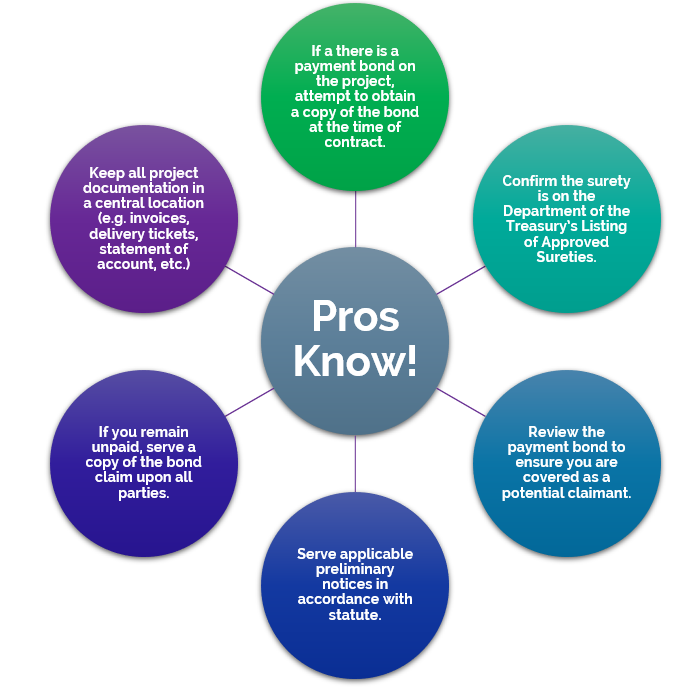 If the payment bond is required by statute, claimants will most likely be defined by the statute. In some cases, the statute may refer to the terms of the bond, or the bond may not be covered by a statute (think subcontractors’ bonds), and the bond must be reviewed to determine the definition of a claimant.